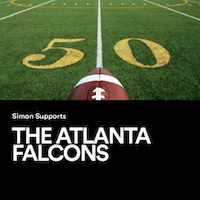 Atlanta-area Simon centers invite Atlanta Falcons fans to join them in showing their Falcons pride at Lenox Square, Mall of Georgia, North Georgia Premium Outlets, Phipps Plaza, Sugarloaf Mills, and Town Center at Cobb beginning this Thursday, February 2. In anticipation of Sunday, fans can “pass” along good luck to the Falcons by signing a card wishing their hometown team to keep rising through the big game. Thursday - Saturday: 10 a.m. – 9 p.m.
Card will be on display in the Lenox Square Fashion Café. Thursday - Saturday:10 a.m. – 9 p.m.
Sunday:12 p.m. – 6 p.m.
Card will be on display in Center Court near Simon Guest Services. Sunday:11 a.m. – 7 p.m.
Card will be on display in the Food Pavilion adjacent to Simon Guest Services. Sunday:12 p.m. – 5:30 p.m.
Card will be on display on the third level near the dining options (next to AMC Phipps Plaza 14). Card will be on display in the food court near Entry 5. Card will be on display in the Upper Level Center Court (in front of Macy's Furniture).